In need of some luck? Well you will find a lot of it. Dragon's Luck Power Reels will bring you lots of luck, fortune, and more. This fiery new online slot by Red Tiger Gaming features 5 reels and 10 paylines. It has the classic oriental theme which is hugely popular in the online slot world with Dragon's Luck Power reels has a beautiful golden design and features include a mega coin feature and dragon coin feature. Fire breathing dragons scorch the reels, offering up to a fierce 3888x your total stake on Mega reel. Dragon’s Luck Power Reels is a Chinese-themed 5 reel, 10 payline slot created by Red Tiger Gaming. While you play, you'll hear a soft oriental soundtrack which goes perfectly with the theme creating the perfect environment to spin those reels and use your slot promotions. The design is also beautiful with wonderfully fierce 3D animations featuring a lot of red and gold. The reels are placed inside a stunning pagoda-style building which has two enormous fire-breathing dragons at either side. The symbols include Chinese style playing card suits Q, K, A, 10, and J, as well as golden dragon coins, delicate pink lotus flowers, a doll, and koi fish. The highest paying symbol is the 138 symbol and this pays up to 3, 888x your total stake when you land 10 on a payline. Mega Coin Feature - The mega coin feature has a huge 3x3 symbol of the golden dragon. This takes up 9 spaces on the reels. Dragon Coin Feature - Whenever a dragon coin lands on the reels, the reels will start to spin revealing a special symbol. This special symbol can lead to some very exciting wins. 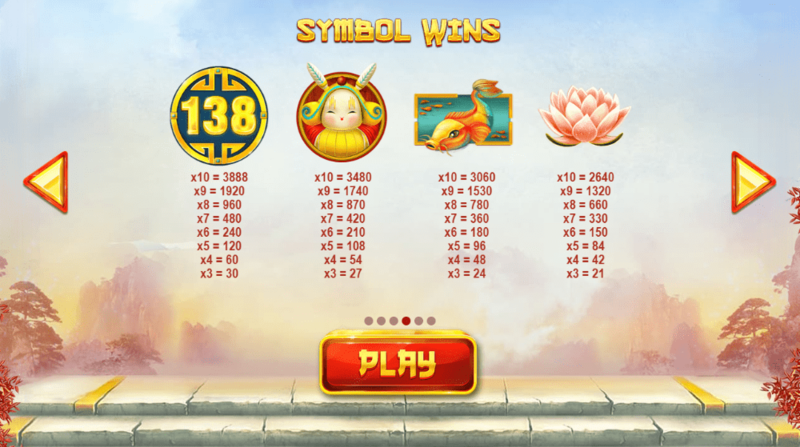 The 138 Symbol - The 138 symbol is the highest paying symbol in Dragon's Luck Power Reels. Filling the entire reel could land you a maximum of 1, 380x your total stake. Dragons - The dragons are lucky! At any point during the game, the dragons can scorch the reels to increase your wins. Click this link to explore these slot games. 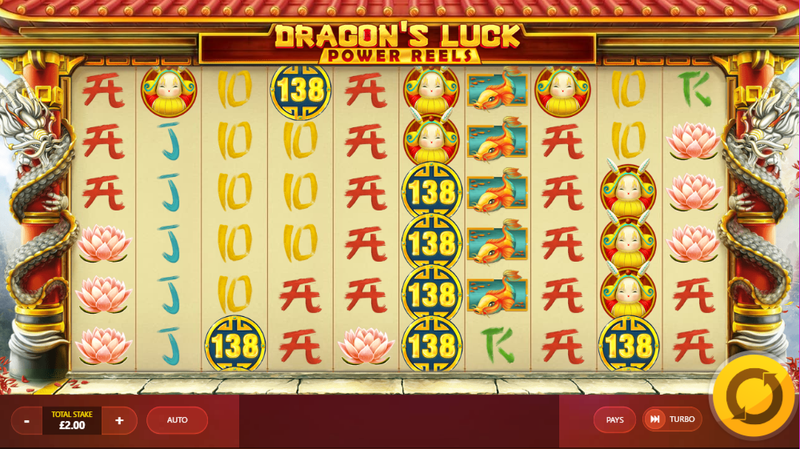 Dragon's Luck Power Reels is a great addition to the many other oriental slots out there. The design is typical to your average oriental slot, however, there is something quite different about this one in terms of gameplay. This Red Tiger Gaming slot has an unusual game engine which is truly fascinating. With wins of up to 3888x your total stake on offer. If you enjoyed this casino game, Dragon Slot is also not a game to be missed.